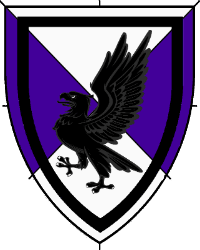 Per saltire argent and purpure, a hawk rising and an orle sable. Name registered with the College of Arms in March 2018. Device registered with the College of Arms in January 2017.